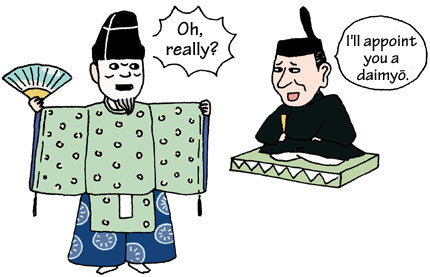 TRIVIA of Noh : Q118 : Who was the actor-turned-daimyō of the Edo Period? | Home | Trivia | Q118 : Who was the actor-turned-daimyō of the Edo Period? Who was the actor-turned-daimyō of the Edo Period? Noh was designated a ceremonial performance of the shogunate and prospered in the latter half of the 17th century and beginning of the 18th century. The fifth shogun, Tokugawa Tsunayoshim was famous for his love of Noh, while the sixth shogun Ienobu was another Noh devotee. The Noh actor Manabe Akifusa became the shogun's personal chamberlain and finally a daimyō (feudal lord). Akifusa was a son of Nishida Kiyosada, a member of the Kofu domain. Ienobu, then called Tokugawa Tsunatoyo, was the domain lord. Akifusa became an actor under the tuition of Kita Shichidayu, the founder of the Kita School. After catching Tsunatoyo's eye with his performances, he was promoted to the rank of lord chamberlain. In 1704, when Tsunatoyo assumed office as the sixth shogun, Akifusa became his vassal. He was later promoted to be the shogun's personal chamberlain and finally became the lord of the 50,000-koku Takasaki clan. Akifusa is the only Noh actor that became a daimyō. With Arai Hakuseki, Akifusa supported the reign of the sixth shogun, forcing through the political reforms known as "Shōtoku-no-chi" (rules of the Shōtoku era). Akifusa also made significant contributions to the world of Noh, the shogun's favourite, working hard to find and revive rare pieces. According to the performance record of Ienobu's era, Akifusa played "Rōgiō", an extremely rare piece that had probably never been staged before.